Waltzing Waters®, Inc. creates spectacular productions for both indoor and outdoor, commercial and private venues worldwide, each featuring distinct personalities, advantages, and opportunities. Whether for an indoor or outdoor venue, a Liquid Fireworks® water show system can add tremendous value and/or revenue stream to any business in any part of the world. Liquid Fireworks® have been featured by companies such as Disney, Sea World, and Universal Studios. As those clients discovered, we provide unmatched quality, reliability and the best value in the entertainment industry with our custom dancing water displays, fountains & water attractions. So the Przystawik family is known for musical fountain spectaculars! Three generations of Przystawiks have gained international recognition as the world’s foremost leaders in water, light and music productions. In the 1920′s, German inventor, Otto Przystawik, conceived the idea of combining the beauty of fountains with the music and gracefulness of ballet. Thus, “Przystawik’s Dancing Fountains” were born. In the beginning, he created musical fountains on a small scale for display in restaurants and stores. Nothing is quite as captivating as a bespoke dancing water show system, watching water fountains dance to the music – perfectly in sync. Water shows systems are exciting to behold yet calming to enjoy – providing a memorable experience. With an array of different colours and fountain routines – water shows could transform your venue to a place of wonder and awe. We can provide references illustrating how Waltzing Waters ® dancing fountain shows have run for years with little maintenance. Proof of reliability is not based on words, but on what’s actually out in the field. Others may claim their products are reliable, but we have the references to prove it. 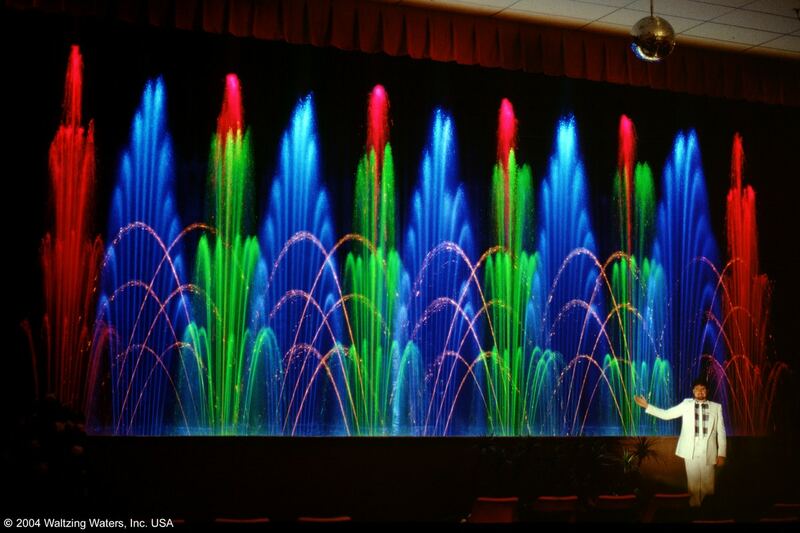 Waltzing Waters ® indoor water light shows may be found in auditoriums, shopping malls, restaurants, etc. Regardless of outside weather, indoor custom light fountains can be seen day or night in an optimal environment. Our water and light shows with music typically run months at a time with virtually no service required other than changing an occasional burned out light. Some of the images shown here are self standing, self supporting attractions. We are always willing to openly discuss the benefits of our designs and how our indoor & outdoor fountain shows and equipment differ from all other fountain products on the market, but the best people to talk to are our past and current clients. Ask them how much maintenance has been required? Hours per day, week, etc. And most important... Would they deal with us again? Get in touch with our experienced team of fountain specialists to find out more!